Corporate clients pose for a photo booth picture at Untitled Supper Club in the timeless Whiskey Library. Corporate 1920s photo booth rental Chicago! Another wonderful 1920s style Chicago venue is Salvage One on Hubbard St in Chicago's West Town. There are many wonderful photo booth backdrops in this vintage space! Salvage One is perfect for fun corporate parties and weddings alike. Chicago company corproate 1920s Great Gatsby themed photo booth at Salvage One Chicago with Sequin backdrop! Chelsea and Brian pose for a photo booth picture at their 1920s inspired Salvage One Wedding! Love the vintage stained glass backdrop at this Salvage One wedding! Another wonderfully classic wedding venue located north of Chicago is the Armour House which is part of Lake Forest Academy. The marble room and library both make terrific 1920s inspired photo backdrops! The Lake Forest Academy Armour House library is a wonderful photo opportunity as well! The bride and groom pose for a portrait inside the Monte Bello Estate wedding reception space! An outdoor wedding ceremony at Monte Bello Estate! A Fotio photo booth setup in the Danada House "Living Room" cocktail hour space. The bride and groom pose for a portrait inside the Danada House! Looking into each other's eyes! The Danada House "Living Room"
Love this family portrait from the Danada House Wedding! A Fotio photo booth setup at the Mayor's Mansion Banquets on Harlem in Chicago, IL. The two retirees pose for a photo booth picutre at the Mayor's Mansion! 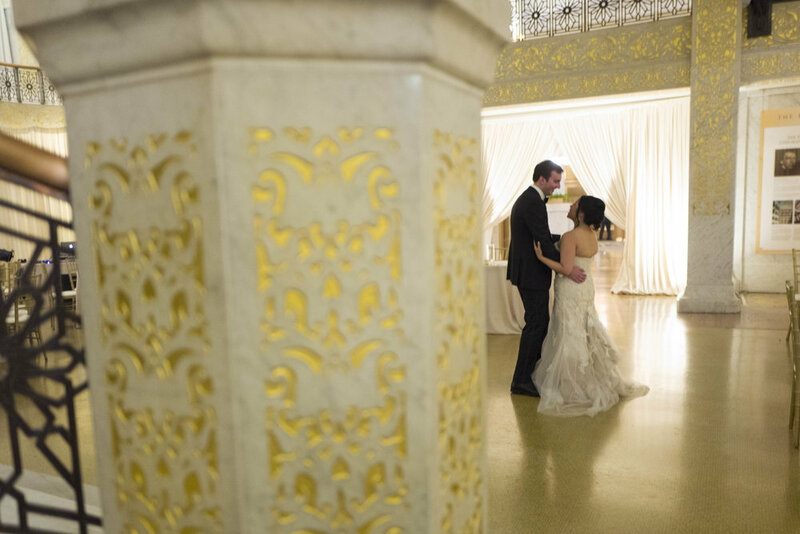 The Rookery Building in downtown Chicago is a beautiful and historic wedding venue. The lobby was remodeled in 1905 by Frank Lloyd Wright and the building has been designated a Chicago Landmark since 1972. Fotio fits in beautifully with the architecture and style of this magnificent Chicago venue! A Fotio photo booth setup in the main lobby of the Rookery Building. Fun family portrait with vintage style props at the Rookery Building! Vintage props for the photo booth! The bride and groom share a dance before guests enter the reception space! The flower girls get a photo booth pic at the Rookery! The grand entrance to the Rookery Building! The bride and groom pose for a photo booth picture with friends in the Rookery lobby! We had such an amazing time celebrating with Olivia and Cody for their vintage themed wedding at The Waterhouse in Peoria, IL. The Waterhouse Banquet and Catering Facility is located in the Maxam building in downtown Peoria just a block from the beautiful riverfront. The wedding ceremony took place in the spacious ballroom at the Waterhouse. After the ceremony guests moved over to The Distillery Room (aka Warehouse Room) for the reception where Fotio photo booth was setup. We used the beautiful exposed brick as the backdrop for the pictures. The Waterhouse is the perfect wedding venue for your Peoria wedding! A Fotio Photo Booth setup at the Waterhouse in Peoria, IL! The bride and groom pose for a photo booth picture at The Waterhouse in Peoria, IL! The bride and groom make their entrance in the Distillery Room at The Waterhouse. The head table at the Waterhouse in Peoria! Having fun with the photo booth! Guests dancing in the Warehouse Room! Wedding guests having fun with the Fotio props at the Waterhouse wedding! Reggies is the perfect place for a Chicago Rock and Roll Karaoke themed Bar Mitzvah! Reggies is a ROCKING place and this party was off the charts! Plenty of room to roam, the kids had a very grown up experience at the famous rock club. Fully equipped with a taco bar, games and KARAOKE!! The kids loved singing their favorite songs up on the big stage as DJ Dominqe played the tunes! Fotio photo booth was set up in the hallway, in front of the AWESOME Reggies rock posters! Everyone had a blast taking their photos and playing with the rock and roll themed props we supplied! We definitely would love to go back for another round of music! This place is the best! Having fun with friends and Fotio! Amazing Fotio background for the day! Mom rocking out at Reggies. Fotio set up at Reggies! Girls having so much fun with the Fotio props! The stage is set for all the kids! Joy District is cool, calm and chic. This place has the full city vibe you are looking for close to downtown Chicago right in River North. Joy District is a perfect location for your corporate holiday party or Chicago fundraising gala! Large beautiful portraits adorn the walls along with the high and decadent ceilings! Fotio photo booth was set up on the second floor in front of a simple, yet elegant black cloth. We had such a great time celebrating a very special person and this place brought out all the stops for a very top notch Chicago event! We really look forward to going back very soon! Fun Fotio props looking super chic in the purple light! The blue lights are hypnotic! Fotio looks so cool with the moody lighting! This was such an amazing wedding at the Waldorf Astoria Chicago! Our vintage photo booth style fit in perfectly at this timeless Chicago venue. The bride and groom provided their own fun stick props along with a gold sequin backdrop which looked amazing in the photos! Everyone looked so classic in black and white! A Fotio photo booth setup at the Waldorf Astoria Chicago! The bride and groom post for a photo booth picture! The bridesmaids pose for a photo booth picture at the Waldorf Astoria Chicago wedding! Tips for the Fotio WEDDING couple. We are sharing some tips to HELP you achieve great photos! Before the big wedding day, take a minute and think about the photos you want. These are the photos that will stay with you forever. Don't have any regrets the next day! These tips will help you prepare for your Fotio experience. Tip #1- "Freshly Minted Married Style"- Put us on your timeline. Make it a point to stop by Fotio first! Get those fresh shots in right away. Come over and we can cheers to marriage. Make sure we get some photos before the dancing and partying starts, Also, it's OK to sneak away from your table for a minute. Tip #2- "Family Time, Late Night Shenanigans"- Make sure that throughout the night you stop back by Fotio to get more photos with your family, friends and wedding party. Think about for the future, who do you want photos with? You hold the key to your own destiny. Three hours will fly by. Make sure you take advantage of your Fotio time slot! Tip #3- "Don't Forget to Vogue, It's All About Sequence"- Mix it up, change your positions. Make your photos interesting. These photos from our archive represent how to range your photos. We really zeroed in on what makes your Fotio experience EXTRA! You only have one night to make the magic happen! When you break down the night and look at the photos, you see the small old school way of the photo booth. We encourage you to take many different photos! Talk it over with your partner and practice your poses.